To make the turkey: position rack in the lowest third of the oven and preheat to 400 degrees F.
Rinse turkey and pat dry with paper towels. Place turkey on rack and set inside a large roasting pan. 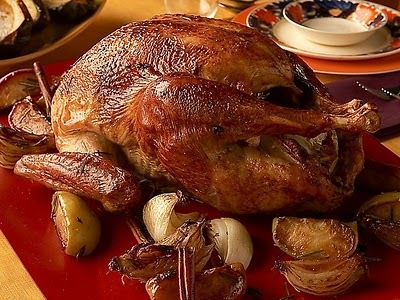 Place the orange, lemon and onion wedges, 2 sprigs of each fresh herb in the main turkey cavity. Tie the legs together to hold shape. Stir 2 tablespoons of butter, the herbs de provence, oil and 1 1/2 teaspoons of each the salt and pepper in a small saucepan over medium heat just until the butter melts. Rub the butter mixture all over the turkey and between the turkey breast meat and skin. Let turkey stand at room temperature 30 minutes before roasting. Cover the turkey breast with foil. Roast for 20 minutes. Pour 3 cups of broth into the pan and stir to scrape up any brown bits on the bottom of the pan. Add the remaining sprigs of fresh herbs to the pan. Roast the turkey for 40 minutes. Reduce the oven temperature to 350 degrees F. Remove the foil from the turkey; pour 1 more cup of broth into the pan. Baste turkey occasionally with pan juices. Continue roasting until meat thermometer inserted into the thickest part of the thigh registers 165 to 175 degrees. Transfer turkey to platter and tent with foil. Let stand 30 minutes while preparing the gravy. To make the gravy: strain the turkey pan juices from the roasting pan through a sieve and into a 4 cup measuring cup; discard the solids. Spoon off the fat from atop the pan juices. Add enough chicken broth, about 1 to 2 cups, to the pan juices to measure 4 cups total. Melt the remaining butter in a heavy large saucepan over medium-high heat. Add the flour and whisk for 1 minute, Gradually whisk in the broth. Simmer until the gravy thickens slightly, whisking often, about 10 minutes. Season as needed with salt and pepper. Serve the turkey with the gravy.